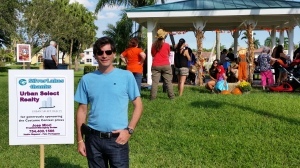 PEMBROKE PINES, Fla. - Oct. 21, 2014 - PRLog -- Continuing with the strategy to specialize on Silver Lakes Market in Miramar and Pembroke Pines, Jose Miori continues to strengthen his partnership with Silver Lakes HOA by sponsoring important events for Silver Lakes Residents. Residents and their children enjoyed an amazing time with the Pumpkin decorating, Costume contest and in the playground. Fun loaded activities topped with icecream truck showing up. Weather was very nice. Sunny & cool helped to enjoy the community park and the marvelous lake views. Family Movie night will be sponsored as well by Urban Select Realty, Polar Express Movie will be shown.